I did not want to title this post “Thoughts on the One Year Anniversary of The Tohoku Triple Disaster”, but that’s essentially what it is. Letting the March 11th date pass without forcing myself to pull my thoughts together would be “mottainai” (a wasted opportunity), says my new disciplined self, and I vow to wade into murky-looking, foul-smelling water, peering into the depths, waiting for the muck to settle a bit and things to become clearer. Not transparent, but at least a bit clearer. Stand back, then–I’m going in! Once in the murky water, there’s no avoiding the images of those who died in the tsunami and have yet to be found; they’re floating just beneath the surface, in constant movement, anxious and restless. Buddhists believe that these souls are trapped, still bound to the physical world and unable to begin the journey to Paradise. They remain in this state until their bodies are discovered, their bones are cremated, and the ashes laid to rest in an urn in the family grave, which is the gateway into the spirit world. 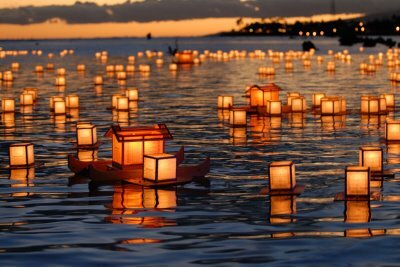 The gateway also allows them to return to their families during the month of August, for the Obon festival, when gravesites are cleaned and scrubbed and food and lanterns are set out to welcome the spirits of dead family members who have been watching over them throughout the year. The ancestors are called “Hotokesama”. JIJI Press reports that the bodies of more than 3,000 tsunami victims have yet to be found, and around 500 bodies have yet to be identified. Most of the bodies have been cremated, and their ashes stored in various repositories until claimed by family members. Read about a Buddhist monk, who made it his mission to watch over the ashes of these unknown men, women, and children, holding vigils and praying for them to be reunited with loving families. And consider the story of Okawa Elementary School, in Ishinomaki. It’s a story so painful that I cannot dwell on it for a long period of time. Here’s the gist of the story, which was recently highlighted in a BBC documentary film entitled “Japan’s Children of the Wave“. The school was considered a safe haven for emergencies, both quakes and tsunamis, and after the quake teachers safely evacuated students onto the playground. Some parents had sped to the school by car immediately after the quake, and were able to pick their children up on the school grounds and flee to safety. Those children whose parents did not arrive by car waited obediently outside as the tsunami, still unseen, began encroaching. While a teacher went in to make sure the school was empty of students, the wave hit, and students, teachers, and staff fled up an embankment behind the school. Seventy-five out of the one hundred and eight students perished, as did ten of the thirteen staff members, one of whom later committed suicide. Few adults were left to bear witness, and the one teacher who survived bore the brunt of the bereaved parents’ grief and anger. The BBC documentary contains a film clip from a meeting called by parents , who demanded to know why the school staff had been unable to save their children. I forced myself to watch as the surviving teacher entered the room, head down, and attempted to reply to the barrage of questions and attacks from parents, some weeping audibly. The film continues, following the attempts of one Okawa School mother to locate the remains of her daughter. The search for students’ bodies continued for months, but her daughter’s body did not turn up. When the official search was called off, she obtained a license to drive heavy machinery, rented a backhoe, and continued the search herself. In the end, her daughter was found. The mother faces the camera and reports, in an emotionless tone, how her daughter was discovered: afloat in the ocean, headless and limbless, a lump of flesh being pecked by gulls. Again, I could not watch that particular scene twice, and yet parents relive similar scenes night after night in their tortured dream-life. Those outside of Tohoku have the luxury of turning off the news or changing the channel, but the nightmare is continually replayed in the minds of those who lived through it and survived. It’s no wonder that people see ghosts in Ishinomaki, and some taxi drivers refuse to even enter tsunami-devastated neighborhoods for fear that their passenger may be a spirit. Other schools fared far differently than Okawa, and similar potential tragedies were averted by well-prepared staff and students, who began evacuating immediately and swiftly in the absence of official orders or organized direction. 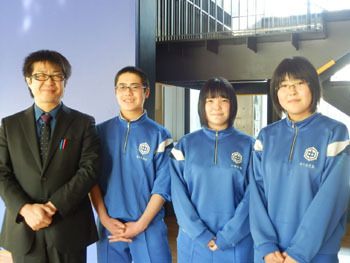 In June of 2011, I wrote about students from Kamaishi East Jr. High, whose school curriculum had included emergency preparation and drills. The quake immediately knocked out the school’s power system, so there were no PA announcements to follow; without hesitation, the students began evacuating themselves to higher ground, even before the teachers had time to step in and direct the exodus. The students fled in the lead, the teachers caught up and followed them, and 350 students from a neighboring elementary school also followed along. All who joined in the evacuation were saved. The story was reported in the Japan Times last June, and today’s paper featured a follow-up story on the students and how their lives have changed in the past year. keep up with their studies in classrooms packed with between thirty-five to fifty students. Many students live with their parents in cramped temporary housing units, adjusting themselves to a new way of life and the barren landscape that was their hometown. “As the debris is cleared away and the remaining houses are torn down, I’m starting to forget what our town used to look like,” said third-year student Aki Kawasaki, “And I hate that I’m starting to get used to the destroyed town.” Still, she and her classmates are determined to move forward, and to share their experience with as many people as possible; Kawasaki herself has travelled to both Tokyo and Nagoya to speak out on behalf of tsunami victims and to share the hope and positivity inspired by her own story. How can fifteen-year olds outside of Tohoku relate to her story? Can they even begin to imagine the fears and hardships she and her classmates have learned to deal with on a daily basis? For this is how many survivors view the situation: It’s not about “overcoming”, which implies a victory, but about dealing with hardship, which implies a refusal to accept defeat. Multi-story container housing unit, November 2011 grand opening. 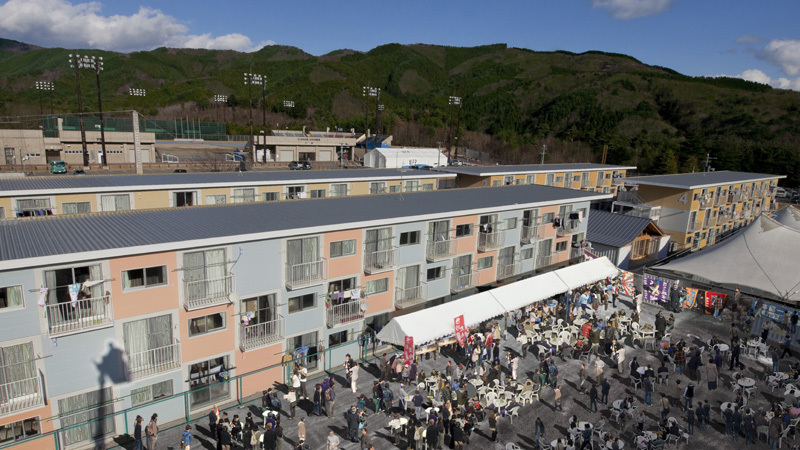 Families and individuals who lost their homes in the tsunami are now living in artificially-created communities known as “kasetsu jyutaku”, or temporary housing facilities. Each apartment is small and tidy, and equipped with everyday basic appliances, right down to the rice cooker. No luxuries, but no-one expects things like dishwashers in the first place, so it seems almost miraculous to get the rice cooker, really. The apartments are not well-insulated and many have been plagued by condensation build-up inside on freezing cold days. One NHK news program that sticks in my memory featured an elderly woman, standing on a chair and vigorously mopping the ceiling of her tiny kitchen….”I do this every two hours!” she declared. Volunteers have done their best to look out for the needs of those living in temporary housing, bringing fuel for kerosene heaters and fresh food and vegetables for the house-bound, shovelling snow and clearing paths, and arranging get-togethers for elderly people missing their daily routine of lessons and social gatherings. Some cities get more volunteers than others, and many residents in lesser-known temporary complexes remain anxious, afraid of behind left behind and forgotten in an alien landscape. They’ve lost the world as they knew it, and their place in that world as well. Grief is a very private thing in this country. I’ve only actually seen my own husband cry once, when a friend from college committed suicide. Never seen my father-in-law tear up, either. My mother-in-law will cry buckets over some ridiculous soap opera, but faces any sort of family crisis dry-eyed. My co-worker hides in the bathroom to shed her tears. My next-door-neighbor shut herself away in a back room of the ceremonial hall during her father’s funeral so as not to face friends with a tear-stained face. It breaks my heart that people cannot throw their arms around each other and speak about their loss, but having lived in this country as long as I have, I understand that many simply cannot. Those who have lost family and friends still struggle to come to terms with their own pain, while those whose families survived feel overwhelmed by guilt and their own inability to communicate. Even before the quake, there were relatively few trained counselors and psychiatrists in Japan, and those few qualified professionals are now stretched to their limits. Countless residents fall prey to depression and alcoholism, yet do not seek treatment. In Japan, any hint of psychological instability is considered a private and shameful matter, and families often choose to conceal the problem rather than seek a solution. The perceived social duty to be resilient and the tendancy in Japan to confuse psycho-social care with mental illness means that those in real need may never seek help. Plan Japan [Kumar’s organization] had to adapt and evolve ways to reach very private people. Tea parties were used as an excuse to bring people together so they can talk and share their feelings. Psycho-social care had to be rebranded as child support. Emotional support or psycho-social care is often neglected in disaster response, yet it is among the most basic needs of disaster survivors……expressing emotions and sharing feelings can prevent high-risk people from advancing to stages where they require specialized mental health care involving psychiatrists and clinical psychologists. The events of 3/11…. have exposed a worrying neglect of emotional well-being in Japanese society, a sentiment echoed by mental health experts who fear that things could get worse. For prided stoicism and economic realities, the pressure on Japan is intense on Japan and its tsunami survivors to resume business as normal. As the world’s third largest economy races for rapid rebuilding and reconstruction, it must not lose sight of survivors’ emotional well-being. It is a challenge and a humanitarian need that must be met. For Japan’s recovery to be successful, it must be matched in mind. So you see the fragility and some of the complexities associated with life in artificially- created communities in Japan, especially for the elderly and for children. And how urgent the need is for listening ears, understanding hearts, kind words, and shared grief. 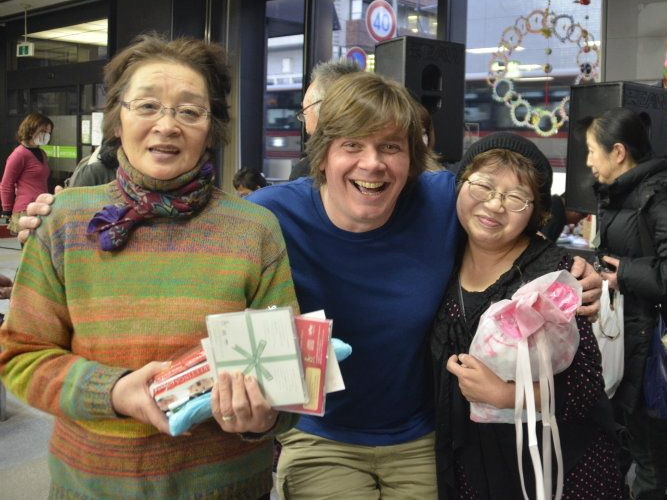 This is one reason that foreign volunteers have been wildly popular in Tohoku. They laugh, they cry, they have no trouble with big bear hugs (and speaking from experience, Japanese folks who would cringe at being touched by one of their own kind often find it a tolerable novelty to be hugged by a foreigner), and they bring the outside world into closed communities. Much is being done, but the need is nearly overwhelming. Take the time to click on the link to “Children of the Wave”, and steel yourself to see it through till the end. It will bring home the depths of the tragedy experienced by families along the coast of Northern Japan, and the gravity of the challenges yet to be faced. As the government bungles along attempting to reconstruct the country, we pray for the recovery of the minds and hearts of the tsunami victims and for the future of the children who lost homes, families, and emotional security at an early age. 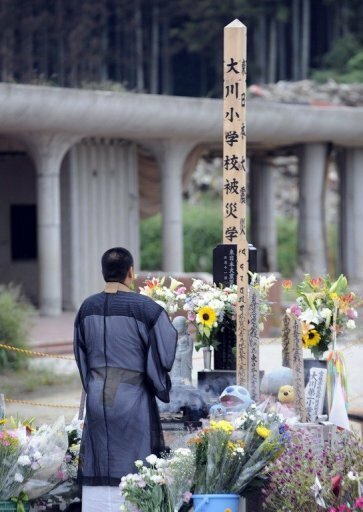 Pray that the remaining bodies of the tsunami victims will be found, their ashes be returned to loving families, and that their spirits will find the gateway to begin their journey to the next life. And for those whose bodies will not be recovered, we must pray that their families can find some closure, and an outlet for their grief and pain. Cities like Ishinomaki will continue to be haunted by ghosts and spirits for a long time to come. Thank you for reading, and continue to keep the people of Northern Japan in your thoughts and in your hearts. My next post will focus on the nuclear disaster; the water will be much murkier, but I’ll wade in and brave the stench. Good night. Thank you for your courage and honesty in your well-written telling of the ongoing repercussions of the Fukushima disaster. These are not the stories our news media typically report which means, to our great peril, that by and large public opinion about our aging power plants in the US continues to be either pro or neutral. Although the subject is emotionally hard to write about – and hard to read about – I urge you to keep up the good work. I think it likely that the Montague Reporter (Montague, MA) would be welcoming of an article from you. This is an outstanding essay – so authentic on all levels. Thank you so much for sharing. I will see the video. A friend of mine – a Japanese college math professor in California – also sent me the link and said it is a “must-see” film. Please keep up your “subarashi” reflections and reporting. It means a great deal to many. It’s been a year and even though some things have changed we still have a long way to go. Even one year later ignorance is a huge problem. I had dinner at a restaurant I usually go to and one of the customers, who is fairly well respected by the owner, started talking about how he “eats rice from Fukushima and it’s just fine.” He said it rather blindly, he didn’t infer that he had checked it for radioactivity, just that he had eaten it. I made the comment on how they are now selling air-based radiation monitors at the local home center for 6,000 yen and the owner’s wife said it was sad that people are trying to capitalize on the fear. Then came a long conversation about the benefits of nuclear energy. I’ll agree, there are some, but like everything it needs to be used responsibly, especially since so few people have control over something so extremely dangerous. I don’t remember most of the conversation, it went beyond my ability to understand fairly quickly, but I did learn a few things. It will always be dangerous if people put blind faith in nuclear energy, or if people refuse to believe they have a personal responsibility to protect themselves. If we put faith in others to do the job and instead leave that responsibility to them, who in turn pass it off to others, and then eventually it just dissipates into nothing, we will only have repeat performances of this in the future. There is no easy solution to this problem, but speaking up will cost the friendships and stability that ignorance offers.